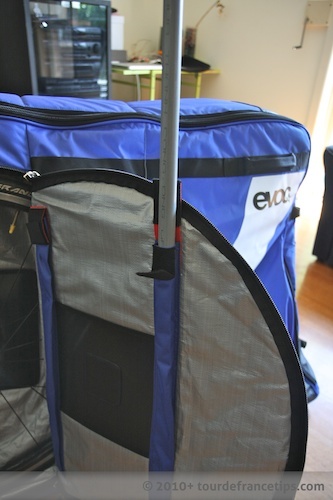 This EVOC Bike Travel Bag Review is more thorough than most. I’ve used a lot of different bike bags and travelled a lot, so wanted to give you my take on this bag. 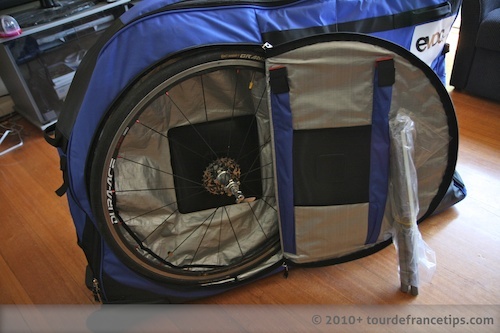 Before we start the EVOC Bike Travel Bag Review, I want to quickly mention what I look for in a bike bag. All of these things, except price, contribute to the overall utility of the bag. Click through each item to skip through to that section. The EVOC Bike Travel Bag Review video is below. Read on for photos and a breakdown. The EVOC Bike Bag is nowhere near as agile as the Scicon Aero Comfort 2 TSA (Scicon Aero Comfort 2 TSA review) or BikND Helium (BikND Helium Review). There are two handles on the front – one down low, and one about half way up – it is reasonably easy to pick the bag up at the front and wheel it along. This is really important in check in lines where you need a highly agile bag. The Polaris or OEM bike pods by comparison, are horrible in this regard. The EVOC would benefit from front castors. You only need to take your handlebars off. Your seat can stay on, and so can your pedals though you can take those off if you want. You don’t have to take the rear derailleur off, but for the 2 minutes it takes, I would. If you do remove it, simply tape it to your down stays and wrap it up in bubble wrap. This bag is very stable and is not prone to tipping over. The only problem with stability is cross winds. If you’re in a cross wind (airport car park for instance), because you must lift the front of the bag off the ground to move it, the wind can tip it over. It’s not a huge issue though. I didn’t take a photo of the bag folded down, but rest assured it scores well in the compactibility stakes, getting a 4/5. It folds down on itself and can be stored standing up in your house or garage, or somewhere in your hotel room, back of your car or campervan if on the road. 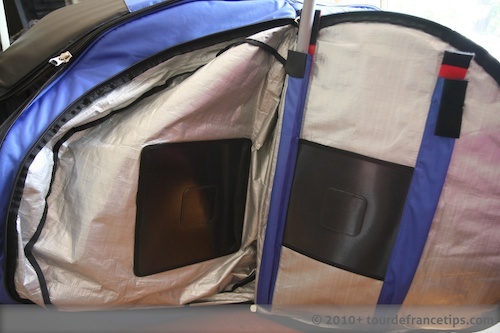 I stored mine away in our campervan storage locker for 1 month with no problems. First up, we take a look at the unloaded bag. It’s not too big at all. They offer some bright colours which is useful as having a big bright bag makes it easier to spot at the airport so do check out the limited edition colours which are pretty cool. This bag weighs around 9kg unloaded. You can see we have 8 handles, which are attached in a very robust fashion. There are 2 on each end, and 2 on each side; enough to keep the baggage handlers happy! One thing I love about this bag is how good the robustness is. The bag has been designed really well. The zips are YKK and large gauge. They slide easily and have extra little grippers on them. These plastic rails help keep the bag solid at the base. The wheels are really robust and attached in a manner that ensures you shouldn’t have a wheel come off. There is a bunch of plastic that ensures you shouldn’t have cracking across the plastic attachors, which can happen on luggage bags. You can also see the plastic bash guard on the back. This should provide protection for the rear derailleur (I say should, not will – make sure you add bubble wrap to your rear D/R). There is a whole lot of this tear-proof latex or rubber-like material at the ends on the top and bottom. This is great thinking as these are the areas most likely to get scratched and torn. Another outstanding feature is the protection for the bike. The padding on the top is around 4cm thick. In the wheel compartments, two plastic pipes are inserted into holders on the flap. This provides protection for the wheels. There are two hard plastic plates protecting the hubs. Probably the only thing I’d be wary of is the rear D/R. In the photo below, you can see I’ve taped mine up to give it some clearance from the rear of the bag. I’d additionally add some bubble wrap in there too. My EVOC bag has been good, but the zip keeps coming open on every flight. My suitcase was smashed (literally) on my last flight and the bike is fine so that is something. This bag happily takes anything from a roadbike to downhill bike. Probably your only issue will be roadbikes with integrated seatposts. To fit my bike in I had to lower the seat down as shown in the photo below. So, if you have an integrated seat post over 100mm, you might be in trouble. You’ll need the the road bike adaptor kit (Wiggle, CRC) to “pad” the front out a bit. This goes around the forks. The block that the rear chain stays and BB sit on moves forward and backward as required and is secured on velcro. 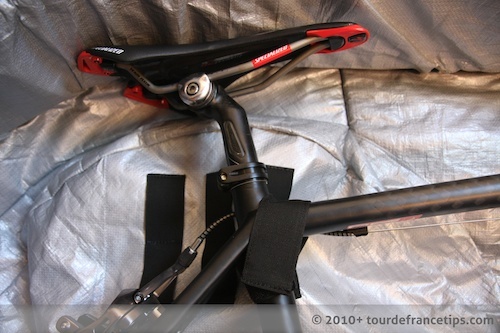 There are plenty of internal straps and the seatpost strap is able to moved to accomodate small, medium and large bikes. In the image below you can see how much room is left for shoes, some tools, extra padding and so on, once the bike is in. One wheel goes into a special wheel compartment on each side of the bag. Skewers come off. Plenty of straps mean you can secure your bike, handlebars and forks with confidence. 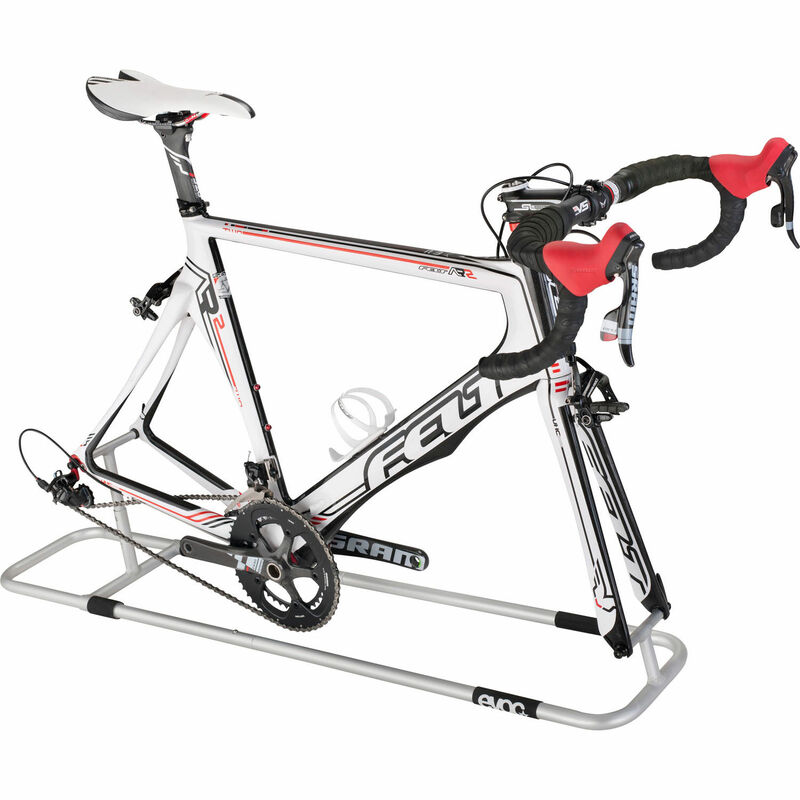 Thanks to reader Wayne for pointing out the new EVOC bike stand (get it from Wiggle). The stand is made from aluminium so is light. One of the problems I had with this bag was that the bottom bracket just sat on the block, with the straps securing the bag. The stand secures the bike using the two skewer points on the frame which is a much better solution. (However, there is a downside – the stand costs around A$110 which makes the bag/stand combo A$550 which is more expensive than the Scicon Aerocomfort 2 TSA. The wheelbase is wide enough that the bag doesn’t even look like tipping over, which is a design flaw of the Polaris Bike Pod, which has a very narrow wheel base which is uneven, so the bag leans to one side when unloaded, then tries to tip over when the bike is in it. The internal material is surfboard bag material, so when it gets greasy, some eucalyptus oil or citrus cleanser will have it clean in a jiffy. All the other considerations contribute to provide a bag with a high degree of utility, or usefulness. To keep the rear of the bag from collapsing on itself, the bag comes with 2 fibreglass stringers which slot into these holders in the back. Great design thinking! They simply come out when you need to collapse the bag down to store it. 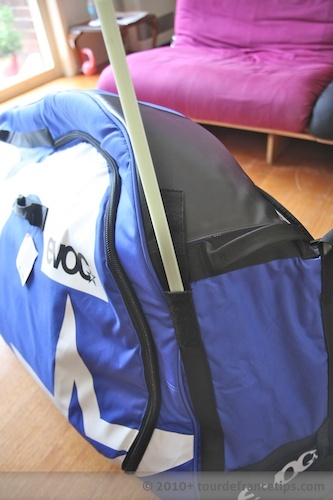 This EVOC Bike Travel Bag Review has shown us that this a great bike bag. It is good value for money, is reasonably light, has great protection for the bike and bag itself (rubber-like bash material), great agility, a useful number of handles and packs down pretty well. It’s obvious the designers (German, I reckon) have really considered user utility as well as longevity of the bag. 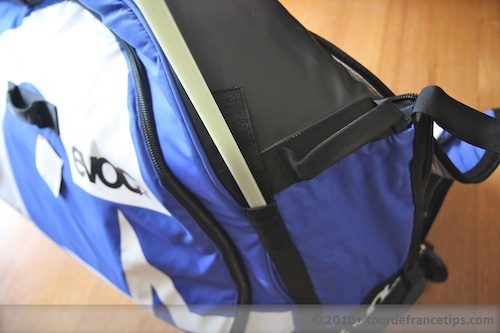 It has lots of internal storage, and with the new bike stand, packing the bag is much easier. About the only problem I had was with packing – the bag tips over and is a bit unwieldy. However, the new bike stand should help in that regard. The other issue is weight and agility. This is a big bag and you can fit a lot into it, so that makes it heavy (unless you pack it light), plus it’s a bit hard to get around (at least compared to the BikND and Scicon). However, the bag has some stiff competition from the BikND Helium and the Scicon Aero Comfort 2.0 TSA review which are about the same price but are better in some regards. If you are in the market for a bike bag, you won’t go wrong with this one. Postscript. I have had a few people ask if you can fit your TT bike in. Answer is, it depends on size. Reader Chr3zzl3 sent in the below image (size M). I’ve also had a few people ask about whether an integrated seat post bike fits. Again, it depends on your frame size. I’d be very cautious in that regard. Anything bigger than a size M might be a tight fit. And that to me sounds like a fair enough reason to get a new bike, just for travel! 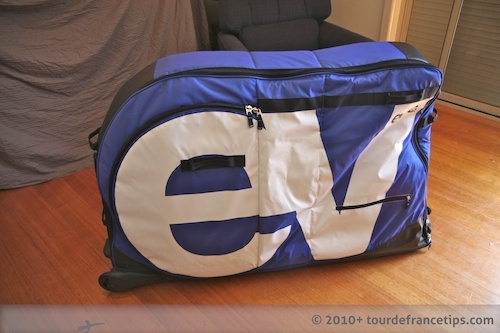 Expect to pay around AUD$400 for the EVOC Bike Travel Bag. I paid AUD$270 during a Wiggle sale (with Platinum pricing). I think given the quality of this bag, it’s a very reasonable price. With the bike stand, the total price will be $530 or so. You can get the EVOC using the below links, or from your LBS. Your LBS may be as competitive as the online retailers on price, and you’ll get good advice and warranty support. Retailer links in the EVOC Bike Travel Bag are affiliate links and these retailers kick us a bit of loose change when you buy through them. This doesn’t cost you anything extra and helps us keep the lights on and doing free reviews like this. This is a great bike bag. It is good value for money, is reasonably light, has great protection for the bike and bag itself (rubber-like bash material), great agility, a useful number of handles and packs down pretty well. I looked on the wiggle site and cant find the Evoc bag and adapter kit? (maybe i am not looking hard enough) Can we purchase from you at all? or can you recommend someone here in Australia. Hi Steve, Wiggle appear to be sold out! I don’t know if they will re-stock, but, you can get the EVOC from Chain Reaction Cycles. I will update the post, thanks for the heads up! EVOC have a bunch of good bags on Chain Reaction, so make sure you spend enough to qualify for free shipping to Aus. Wiggle have these back in stock, or relisted. Thanks for this informative review. I pulled the trigger on one of these from Wiggle a few days ago, and I’ve yet to try it yet but it looks like it will be great. I’m packing an Argon E-114 time trial bike into it so I’ll need the road bike adapter which I did not order (it would be nice EVOC if you included this as a standard item). 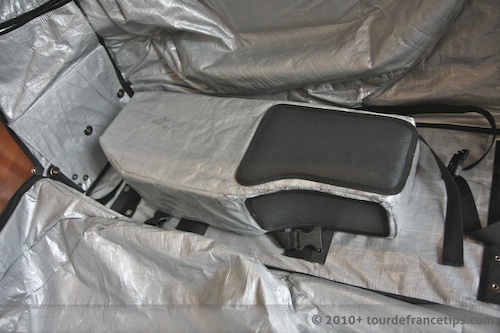 Hi Tim, what is your experience with fitting this EVOC bag into a European rental vehicle such as Renault Megane or Passat Sedan or Wagon. This is the only bike on our trip, the car will have 2 adults and 1 child with std assoc luggage. Should it fit ok do you think? that is going to be a tight fit. Very tight. Even if you roll the bag up and get it in the boot, the bike will have to go on the roof. I’d recommend a people mover (think Kia Carnival size of car). Mars, you could get a Scicon Aero 2 TSA. Or, a Helium. Links: Wiggle, PBK or Evans. The Helium packs down well! Thanks for the informative review and great website. 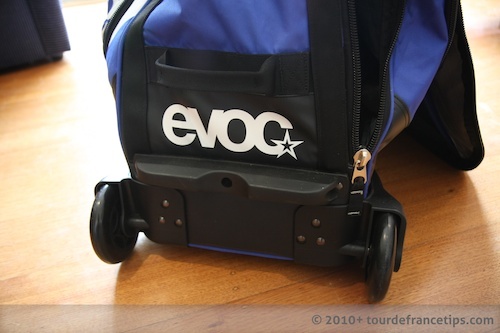 Do you think the EVOC bike bag with bike in it would fit in the back seat of smallish type vehicle (e.g. somthing like a corolla), or would you really need to be able drop the rear seats and put the bag in the boot. Looking at travelling with it and from experieince a lot of rental car companies provide sedans type models where the rear seats may not drop down. Well, it depends on how many passengers will be in the car and what other baggage. Really, the EVOC doesn’t pack down as well as the BikeND Helium or the Scicon Aero Comfort plus. If I was hiring a car, I’d want something as big as a Commodore – I presume you’re from Australia, so you’ll know what this is. If you’re not an Aussie, imagine a bigger sedan. Better still would be a station wagon, think along the lines of a Citroen, Renault, Passat and so on. If you have a few of you, you’ll need to step up to a mini van or people mover. How many people/bikes are going? Thanks for the great website and review. 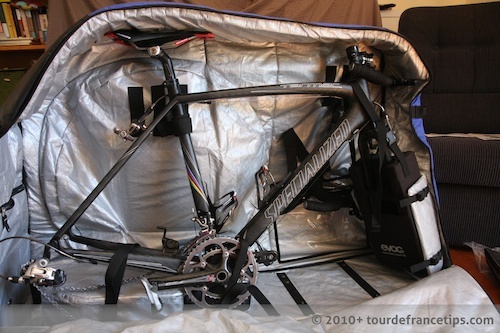 I will be travelling to France from Australia this year for the Tour de France and am looking forward to taking my Orbea Orca, will the EVOC bag protect my bike well enough to ensure that it makes it the distance or am I better off getting a hard case. Hi Isaac, thanks for the kind words! I think it’ll be fine in an EVOC. I am taking my Look 586 in it. Just have good insurance that covers loss/damage by airlines. I have recently purchased a cervelo P2 TT bike and am looking for a bike bag that will suit this type of bike and protect it. I have looked at aerocomfort plus, biknd helium and evoc. Can you recommend out of these 3 bags which is the best and suited for a TT bike. I am travelling to the noosa half ironman in october and need to pack bike up for plane travel. I can’t actually give you any feedback on the Helium – I’ve asked Chain Reaction, Wiggle and PBK (Wiggle said no) for a bag to review. The EVOC might be ok depending on how big your TT bike is, and if the seat post is adjustable…prepare to pull the bars off though. 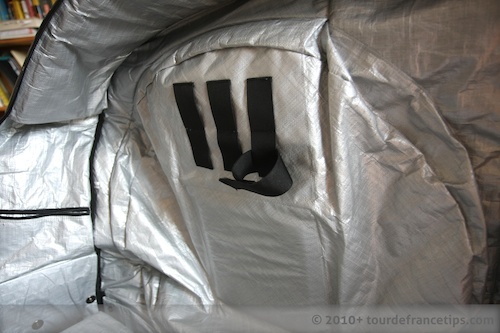 Aero Comfort might be best bet for the least amount of dismantling but you will have to protect the bag big time. If I get my hands on a Helium from CRC or PBK I’ll review them asap. Great review. One question regarding the size. I have a Ridley Noah, XL frame which has an integrated seat post. About 1 inch has been cut off to fit. Would this fit inside the travel bag, or can you suggest the best way to measure the bike? If my bike wont fit inside the EVOC, can you suggest another bag that would suit. Inside bag from bottom to top is about 85cm. From top of BB block to inside top, around 70-75cm (depends how far you stretch it). I have an XS Look 586 (removable seat post) and took the post out as it wouldn’t slide down far enough – and that’s an XS. You could try a Scicon but I couldn’t confirm the inside dimensions. Will ask my mate who has one and he is pretty tall. .-= Tim´s last blog ..TDF Tips site update, Survey Thanks, TDF Tim update, Videos! =-. your bag reviews have steered me toward the Evoc. I too lost a sci con bag wheel somewhere in France. Actually found the wheel and a replacement nut. Apologies to the next occupant of my hotel bed. The beds nuts were the perfect size. Used a fork for a shifter to tighten it back up. Anyway thanks for the tip. Thanks for the feedback. That’s a well funny story! The VeloNomad Scicon Aero Comfort Plus review is now up. i am traveling over to italy in May 2012 and am going to buy a travel bag/case and your review is leading me also to the EVOC. We’ve just purchased 2 of these for our planned trips in 2012. Without the road bike adapter fork adapter it seems this product is extremely difficult to use and the bike just doesn’t fit properly. And there is no-one, anywhere in the world, that has them for sale. Not even Evoc themselves. I doubt they actually still make them. To not include it with the product is almost criminal. I would suggest you DO NOT BUY THIS PRODUCT unless you can source a road bike fork adapter first. Or be prepared to manufacture your own. Yep, they can be hard to find and the decision to sell them separately is confusing. However, you can jury rig it by using towels or bubble wrap around the forks. I’ll contact EVOC and let ’em know! I emailed EVOC with this comment thread and their feedback (from the MD of Product) was that the bag was originally for MTB, hence it shipping without the adaptor. He also said that it certainly was available. He said that including the adaptor would increase the cost of the bag. I responded and said that despite the original target market of the bag, things change and I had a well informed guess that roadies would make up a larger market now. I also said that including the adaptor would only add 7% to the cost for those who didn’t need it (and there’s a ready aftermarket on ebay). I also mentioned that Wiggle and CRC both don’t have availability right now, and often don’t. Thanks for your comment! All very excellent additions to the conversation. update: Look, I was a bit, umm, agitated when I wrote that post. I sourced the road bike adapter from the USA and all is now good with the bag, although I’m not convinced the way the bars are packed is that good as they will rub on the frame. But the adapters are now available in Australia. The distributor tells me they ordered 200! In Sydney you can contact Velosophy to order. See you at TDU12. Hey Stuart – no probs at all! When you pack the bars make sure you use the padding provided and use extra protection. You could check out the post I did on how to pack the EVOC video and photos I did. Decided on the Evoc based on this review. It arrived from Wiggle last Friday (13 January 2012). Quality is very, very impressive, looking forward to using it for my visit to the French Alps in the summer. I got the road bike adapter from http://www.bike24.com. They’re a German retailer, I ordered the adaptor on 10th January and it arrived the same day as the bag! Cost €25 delivered so a little more expensive than Wiggle, but hey, I’ve got one! I’m really glad this review helped you decide, and more importantly, that you thought it was accurate. Thanks for the heads up on the availability from bike24.com too. I am told Wiggle and CRC should have them in stock soon. For the Aussies, Velosophy in Sydney have them. are the wheels really well protected? I own Zipp1080 and Zipp 808 and I am really concerned about packing my wheels in the Evoc and then fly around the World with the airline guys throwing around my bag. Is a hard case the better choice for these kind of Time trial wheels? Thanks for having your thoughts in this. they are fairly well protected. Two plastic pipes on each side protect each wheel (2 per wheel). However, as with anything this is not foolproof. If you must fly with Zipps, then a hard case might be the go. Otherwise, if you aren’t entering a competition, maybe despec the wheels you take! I took Durace clinchers the last couple of times – next time will be Open Pros. Thank you for the detailed video review on the EVOC bike bag. I will soon be purchasing a new custom touring bike in the U.S. and bringing it down by plane to Mexico (where I live) I plan to do some domestic traveling as well. After watching your review, I’m very interested in this bag. I’ve never had issues at airports flying to/from Mexico (e.g., pilferage, etc.) but it always remains a concern when traveling to/from/in developing countries. I like the fact that this bag is light weight, yet seems sturdy. I have to play around with the 20 Kgs allowed for sports equipment with the airline I normally fly, so this bag also seems to work well. Now, can this bag be secure with good locks for both the main and side compartments? Also, could I fit removed full fenders in it? Would appreciate your views or concerns about this matter. No worries, thanks for the kind words. The bag can be secured with good locks for sure – obviously you want TSA approved ones. You will definitely have room for full fenders, if you are talking about what I think you are (detachable plastic fenders). I hope to do some travelling with my bike in tow and am looking seriously at the Evoc Travel Bag gauging from the positive responses on your site. I will be relying on public transport in the main during my travels to Europe/UK/North America. Would it be feasible for me to carry the travel bike on board a passenger bus, say to get from the airport to a hostel, in the locations outlined above? To be honest, I think you’d be better off with the Scicon Aero Comfort Plus. The EVOC is a bit heavier and more unwieldy especially in light of the fact you’ll be train/bus hopping. If you’re only doing it a few times AND you’re not loading the bike bag up and you don’t have loads of luggage it might be ok, but I’d be more inclined to go for the Scicon under this scenario. Thankyou for your prompt reply! I’d like to think that I would be able to come up with a solution B4 I embark on my overseas trip in a few month’s time, in terms of procuring a reliable bike travel case! I am looking into off-road multi-day venues in places such as Moab (Utah) and Scotland Coast-to-Coast. 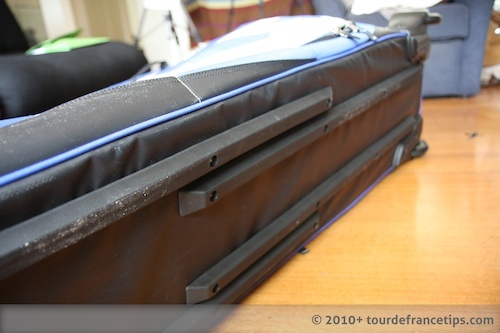 Fortunately, both my hardtail and my dual-suspension bikes are lightweight, and I am hoping that this would go some way towards facilitating my movements when it comes to carrying a back-back and pulling a bike travel case along. Incidentally, my dual-suspension bike is a good quality product, brand new and not rode-tested as yet; and so, I would like to ensure that there would be adequate protection for the long journey ahead. Can you recommend any light-weight hard cases with compact dimensions in order to better cope with the constraints involved with having to rely on public transport? A travel case which will accomodate both configurations, viz MTB and Cyclocross/Tourer, would be advantageous for future undertakings! Also, I’ve just been looking at the Bigfoot Elite Series MTB Hard Case; it’s expensive, but it’s a joy to behold. PS Re Scicon-Aero: I have referred to your review and can appreciate your sentiments, and I too am not so impressed with the quality of the product! Can’t recommend a light-weight hard case as they pretty much don’t exist! Most hard cases (that can fit a bike) are quite heavy. And, if you’re taking an MTB, probably the EVOC is your best bet as they were originally made for MTBs. Hi again Tim. Just some feedback on my first trip with the Evoc. Returning from TDU in Jan my bag got sent to MEL instead of SYD, then back to ADL and then onto SYD. Although it survived the trip down OK, this multi-return route proved its undoing – literally. The zipper on the right hand side as you look at the opening un-zipped from the start point at the base. When my bike was finally delivered to me it was open all the way up the side so I’m lucky nothing fell out as I had my shoes, tools etc in there. The bag itself was also damaged. I know that this is caused by rough handling but I wouldn’t have expected the zip to fail so readily. The design really should stop the zip somewhat higher up as it took the full force of the rough handling. Two friends with exactly the same bag had no issues at all. Here’s a photo of the damage > https://picasaweb.google.com/stuarthickson/General?authkey=Gv1sRgCNqOnsjIyLHukAE#5730013905187194098. BTW, Qantas paid to have it fixed, which amounted to the zipper being stitched at the base to stop it unzipping again. The damage to the bag was not repaired. That is bad news that your bag being damaged is bad news (and made worse by Qantas’ failure to properly compensate you). I’m glad the bike was ok, and you didn’t lose anything though. I might drop Qantas a line about it. Would your insurance cover any of this? Such a detail! That’s one of the best reviews for bike cases I have seen on the Internet. You could easily work as an editor at Engadget.com for such quality. I will Google+, Facebook like it. Congratulations. I purchased an EVOC bike travel bag and have used it a few times. Unfortunately one of the stringers (plastic supports) have snapped (one of the longer ones). Do you know if it is possible to order some replacement ones and where I might do this. Alternatively do you have any suggestions for replacing it. That’s bad news. I’d drop EVOC an email directly, and see what they can do. Otherwise, some fibreglass from a local manufacturer (surfboard shaper, maybe), might be worth a shot? Dave G could try a length of the fibreglass material that is sold in yacht chandlers for sail battens, it appears to be about the same profile and is available in various flexibilities I think. Thanks Steve – that is an awesome tip. Have you got a link for somewhere they can be bought online? Hi Tim, greetings from Singapore and great review on the Evoc. I m considering getting one. Have you travelled with the Evoc on Air France or any other airline which require you to pay excess baggage or for special baggage? Looking at the size of the bag, I wonder if I could just check it in as my 1-piece baggage entitlement. I’ve not travelled on Air France. When I flew back in 2011 from CDG to LHR I was on a BA flight connecting to QF at LHR. BA didn’t honour my QF baggage, so I had to pay 40EU for the Paris – LHR leg. Generally speaking, the bag will be counted toward your free allowance, unless, you fly on certain carriers. I am building a tool that will give you all this information. I don’t have a release date yet. Having just returned from a trip to the Giro and on to France I have some more feedback. My partner, who is small & not physically strong, found it difficult to wheel the Evoc through large international airports (or even from the taxi to the checkin), especially at its max weight of 32kgs. She had to stop every 100m or less to change hands found it pretty taxing. I also found it pretty tiring, having to change hands regularly as we navigated reasonably long distances between terminals. Maybe for those who aren’t that strong a bag with wheels at each end would be better. I think you’re spot on. In this case, you need to pack the EVOC light, or, use a Scicon (and still pack light). I don’t think there is a bicycle case that can boast about being a dream to carry around airport terminals. Even the ones with casters on both sides tend to tip. These cases are made with the main goal of protecting your bike from airport gorilla handling. If it succeeded in that (your bike arrived intact home!) consider yourself a big winner. As far as carrying these things around airport terminals, hire a skycap. They are available at any airport for a tip and so worth it! I think you’re pretty spot on. 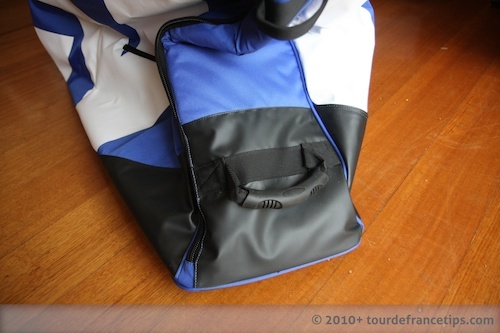 I mentioned that there’s not one “best bike bag” in the How to Choose a Bike Bag article. It all depends on what you want. I reckon the BikND Helium looks pretty good – I am trying to convince BikND to send me one to review! I noticed in your photos and how to pack video you left your pedals on. Do they need to be removed for packing? Paul, I removed them, but you could leave them on. We are a family of 4 going to Europe later this year. We will be taking 2 bikes with us & are looking at buying 2 of these bike bags. We are leasing a station wagon while we are there. From our research it doesn’t look like we will be able to fit the bags inside the car along with our other luggage & 2 people in the back seats. Do you think we could easily strap the 2 bags onto a set of roof racks? Hi Neil, not easily you won’t. Have you considered mini-van hire? Otherwise it might be worth getting a car with bike racks then rolling the bike bags up. Station wagons aren’t as big as say a Commodore station wagon (or Territory). I think a 54cm ISP would fit in the EVOC and possibly BikND. Scicon would be touch and go. Bought bike bag and used it for first time last week. My comment is not a result of the trip. Here goes… the fiberglass rods at both ends used to stiffen the bag come with rubber ends. Needless to say that the bottom ones, the ones leading the rods into the slots come off and are forever stuck inside and at the bottom of the cloth rails into which the fiberglass rods go in. Very annoying. Otherwise very happy with bag. I bought an EVOC and own a Giant TCR with ISP. It’s a size M/L and I have long legs. My bottom bracket to seat rails measurement is about 750mm (about 780 to top of saddle). It’s a bit of a squeeze to get the bike in the bag but it definitely fits without issue. Just thought I would let your readers know as I couldn’t find any info on the subject of ISP bikes fitting in bike bags when I was researching. I am looking for something that I can use, but then when I arrive at my destination I am able to pack up and store either on my bike or in a back-pack… I haven’t seen any cloth only bags that I trust to actually protect… where is the middle guy???? You’ll want the EVOC or Scicon. Both reviewed on this site! 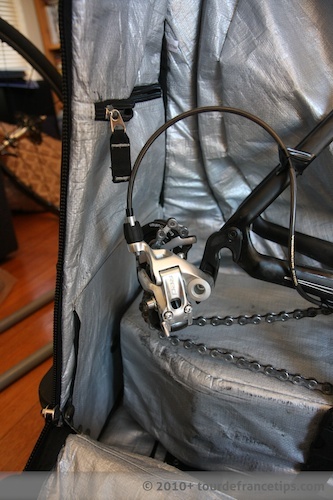 Does this bag support CX bikes with disc brake and thru axle (front 100/15, rear 142/12)? It should yes, depending on bike size. Your mileage may vary, as always.